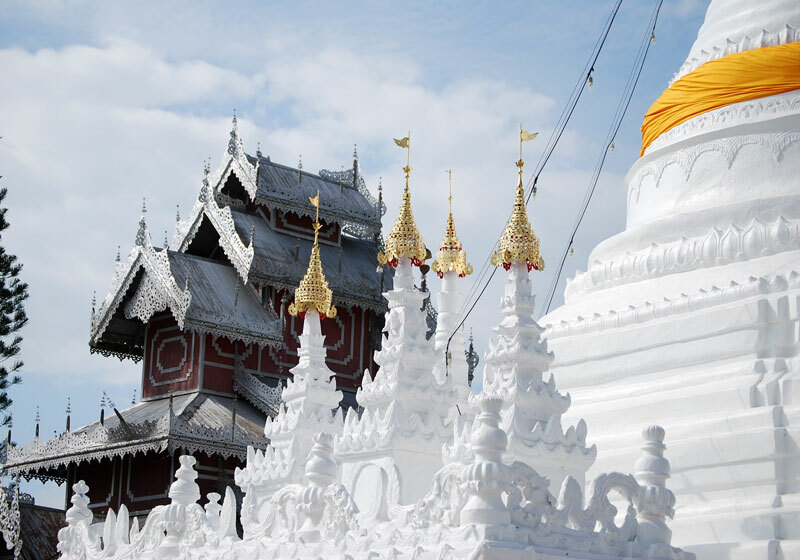 Erected by the first governor of Mae Hong Son, Wat Phra That Doi Kong Mu reflects the strong influence of the Burmese. The highlights of this attraction are the two lavishly decorated pagodas. Also, this hilltop temple affords an exceptional aerial view of the city and surrounding mountains and valleys. Short Description: Erected by the first governor of Mae Hong Son, this temple reflects the strong influence of the Burmese. The main feature is the large pagoda in the middle of temple compound that is believed enshrines the bones of Mokkhalana Monk, the main follower of the Load Buddha. The highlights of this attraction are the two lavishly decorated pagodas. Also, this hilltop temple affords an exceptional aerial view of the city and surrounding mountains and valleys which visitors can enjoy both sunset and sunrise behind the mountains. Set behind the temple is a small cafe you can set back, have a cup of coffee and enjoy one of the best valley views in Thailand.